I’ve got to admit that I have a soft spot for Paris. I spent a summer living in the Marais after college and loved every minute of it. You instinctively feel a connection to certain cities, and Paris is one of them for me. But it goes back further than that. I grew up in Arizona, and when pretty much every kid I went to school with enrolled in Spanish classes (in Tucson we were just an hour from the border, after all), I was one of the few who opted into French. I’ve always been in awe the culture, the food, the cinema—and even spent a year mail ordering Netflix DVDs to watch everything from Breathless and Contempt to Midnight in Paris and Marie Antoinette. But more than anything, I couldn’t get enough of the fashion. My room growing up was always plastered with ads from Chanel that I carefully tore from the pages of magazines, and when my birthday came around one year, I asked for a subscription to French Vogue. I would religiously click through the runway shows on Style.com and watch behind-the-scenes videos hosted by Tim Blanks (remember those?) and told myself that one day I would be in Paris to see fashion week for myself. At the Saks Potts showroom. I spent each day packing in meetings to preview collections and meet with up-and-coming designers. At the Dior “re-see.” It wasn’t until I worked in fashion that I learned that “re-sees” are where editors can see collections from the runway in person. Stepping off the plane at Charles de Gaulle, I couldn’t help but think that it was a moment that I’d “made it” in fashion. The summer I lived in Paris, I was able to watch PFW unfold from a distance. I remember getting a table at L’Avenue just to sit there and observe. I didn’t have enough money to get anything expensive but ordered a Coca Light (Diet Coke) and then sipped and watched all of the editors and models walk in and thought to myself “one day.” It was there I decided I wanted to work in fashion and hoped that in the future I would be back to live out PFW for myself. From the minute I arrived, I knew I wanted to experience, well, everything. 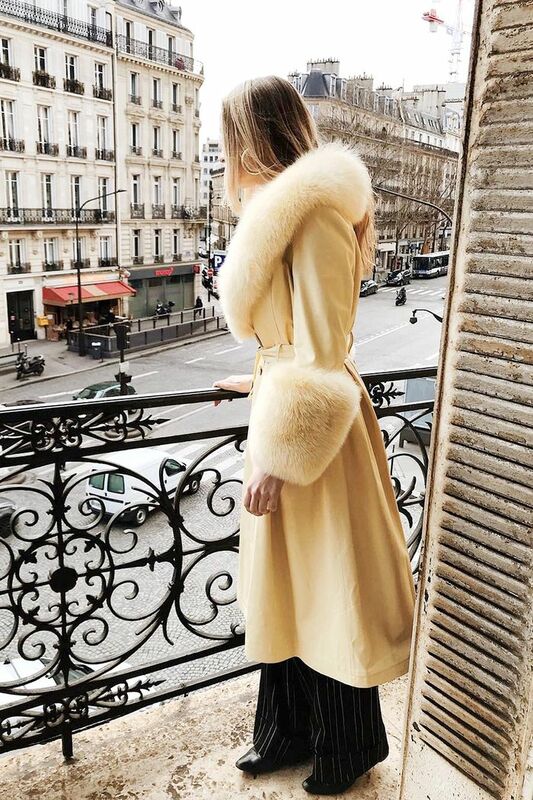 After I checked into my home away from home at Hotel des Grands Boulevards (a buzzy new hotel that feels like stepping into the world of Wes Anderson and a place I plan on returning to again very soon), I packed my days with meetings and events and runway shows. I stopped into vintage shops and visited museums and sat down for afternoon coffee with Parisians I knew from Instagram, engaging in a kind of study of French style and culture. And by the end of the week, I felt like Paris had reignited my excitement of fashion—starting with the way people dressed there. I took a note from Parisian women and kept my outfits easy and streamlined and in line with my personal style. Street style stars paraded into the shows in attention-grabbing outfits, yes. But I noticed that the Parisians had a more understated approach to fashion. At Isabel Marant, I sat across from Caroline de Maigret, Jeanne Damas, and Alma Jodorowsky—three French women I’ve admired from afar for years. Each of them was dressed in jeans and ankle boots with a blazer or faux-fur jacket thrown on top—looks that felt authentic to them and outfits you’d probably catch them wearing on a regular day. In Paris, women are pulled together and stylish, but the balance of beauty and ease always stands out to me. A shot of me sitting at the John Galliano show. And the shows themselves made me tear up. For the week I was there, I was completely captivated by the spectacle of it all. I’ve been to New York Fashion Week in the past, but I’ve never experienced anything on the scale of the shows in Paris. For Louis Vuitton, the Louvre was opened up after hours just for guests of the show. An open-air courtyard was converted into a sci-fi scene with amphitheater seats that hugged the walls. A ramp descended over the room as music started playing and models stomped out in the futuristic pieces dreamed up by Nicholas Ghesquière. After the Chanel show, I found myself on Rue Cambon—the very place where Coco Chanel opened her first store in Paris. I didn’t even mean to head that direction, but it felt like a happy accident that I ended up there. And then at Chanel, the Grand Palais was completely transformed into a wooded forest with real trees and a carpet of crisp fallen leaves. The trees were covered in green moss, and the space even had the distinct smell of soil, which was in fact brought in for the show, giving it the feeling of autumn in Central Park. Chanel is known for some of the most stunning sets, and I’ve always watched Karl Lagerfeld’s ability to create these mini worlds for the short duration of a fashion show from afar, but it was pretty wild to experience it in person. When the models started parading through the muddy leaves in their tweed coats and mismatched earrings and fold-over totes, I was instantly transported six months forward to fall—exactly where fashion week is supposed to submerge us. My one regret from PFW? Setting down my Chanel invitation, hand-calligraphed with my name, for a moment only to find that someone had picked it up. I’d planned on keeping it as a memento from my very first Chanel show but nothing can replace the experience of being there to take it all in.